It isn't that I don't value the democratic system; on the contrary, it's precisely because I value it that I don't want to taint it by endorsing with my vote the circus of inbred freaks that is the French political class. I never vote, ever. Yet this past week, and for the first time ever, I found myself in a bit of a Cornelian dilemma. For those of you who have more productive things to do than wabble in French Classical literature (fear not: most of the French don't, either), a Cornelian dilemma is a sort of no-win situation wrapped into a Pyrrhic victory. Named after Pierre Corneille (dubbed “the founder of French tragedy”), who first introduced an unsuspecting world to this hopeless moral issue in his play ‘Le Cid', it is “a choice between actions which will all have a detrimental effect on the chooser or on someone they care for.”—In this instance: me, myself, I, a few of my relatives and friends, and a large chunk of the Western world. Unlike Corneille's El Cid, my dilemma wasn't between banging my girlfriend or wasting her father (I bet you can tell that was written by a Frenchman, now) but rather between voting for someone who deserved to lose, and not doing my humble part to minimize the score of someone who did not deserve to win. On one hand, Hollande's election pitch (the candidate's Profession de Foi, or “profession of faith” as it is called even, ironically, by those Frenchmen who claim that God is dead) reads like he and the Socialists have been living on another planet for the last 20 years. I mean, I knew the French Left was in a semi-fossilized state since the early 1970's (the French Communist Party was, after all, the last Stalinist party in Western Europe, long after the others ‘reformed' themselves) but I never knew the Socialists were so economically, socially, culturally and politically retarded in this glorious year of 2012. Candidate Porcinet's profession of faith reads like the Ten Commandments of last century's People Prophets: punish those who succeed (until they move to Britain or Switzerland), plunder big businesses (in case they'd still harbor any intention to go for big employment), force or flatter and in last resort coerce and submit as much as possible to a State whose expansion you will feed through taxing everything that moves (and keeps moving, dixit le Gipper), while spending more than you have and borrowing whatever you can't steal. Looking at the French Left these days, you can almost feel a North Korean-lite level of insanity at work: no matter that the money is running out, that the standards of living are falling steadily and will continue to do so, these guys want to carry on, nay, extend the very policies and practices that brought us in this sorry state of affairs in the first place. The horrible truth about the party that is now at the helm in France is that they are, and I weight my words carefully, completely mental (though in truth, the previous one was only ever so slightly less bonkers), while the added horror stems from the fact that they've just been chosen by a slight majority of the voters. On the other hand, Nicolas “Tricky Nick” Sarkozy did deserve to lose. Back in 2007, he fooled the better half of the voters by campaigning on a free(ish)-market / small(ish) government platform, before making a u-turn (okay, maybe just 170°) as soon as he was elected, aggravating both his friends on the Right and his enemies on the Left—who hate him for being at times (though admittedly not all the time) more effectively, and in some tragic way more efficiently, Left-wing than themselves. Cue his disgusting pandering to the Ecologists and hard left unions at the ‘Grenelles de l'Environment', including but not limited to, his warm introduction of Al Gore as “President Al Gore”. On the third hand (that's the one the big French state was slipping in my pocket while I was foolishly debating the other two) there is one thing with which I can blindly entrust my fellow Frenchmen: they always have, and always will make the worst possible choices at the worst possible times—and this time again, they did. So my ‘solution' out of this dilemma? Well, knowing that Sarkozy couldn't win, even with my vote, I felt desperate enough at the prospect of a Socialist plebiscite that I would give him my vote, thus clinging to the bittersweet consolation of knowing that in the end, I did my part to minimize Hollande's victory margin—no matter how useless this might have been. 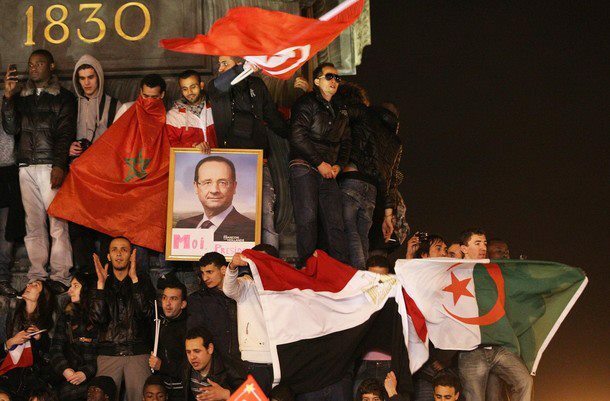 Having said that, there is a sad irony in Hollande's victory: Socialism put us in our current ordeal, and as this train wreck is headed to its dreadful conclusion in the coming months, I find it only fair that Socialists be at the wheel when the disaster strikes. They'll have a much harder time getting away with it, as they've had so far. You know there's a French version of that ridiculous electro-rag now? 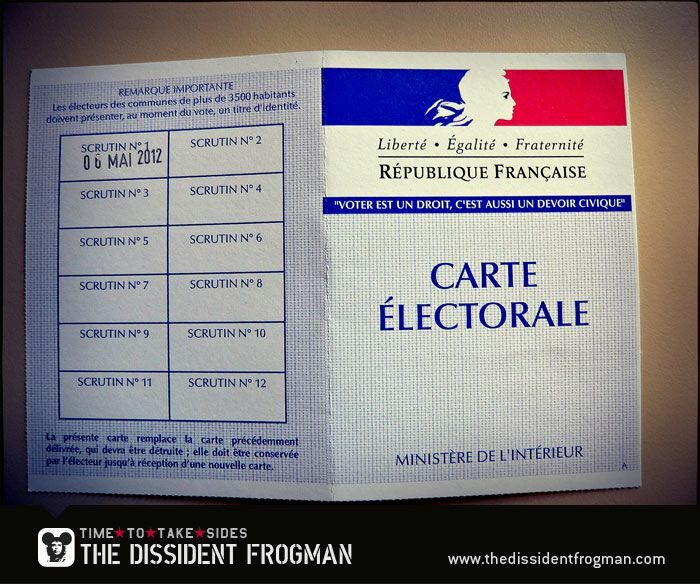 Note to American lefties who recoil with horror when “hicks from the sticks” want to enforce Voter ID laws in the US, and yet regard France as the epitome of Civilization and Progress: as French citizens, we cannot vote without being registered, going to our State-assigned voting station, where we will have to present our State-issued voter card and one among several State-issued national ID (national ID card, passport or driver's license), signing on one register next to our State-issued voter number before we enter the booth and then sign another register after we slipped our ballot into the box, and, as seen in the photo, have our voter card stamped with the date of the vote3 for each suffrage. Now what where you saying about the Police State of Texas and Arizona, again? In case you're wondering: no, we don't get one extra vote once we've filled the card. This is not Obama's election. Read Michel Gurfinkiel's "France: A Referendum on National Identity" on PJ Media, if you (still) wonder what this is all about. I feel for you, frogman. Looks like France has turned into a country of coddled children who want Government to be mommy. This never ends well. 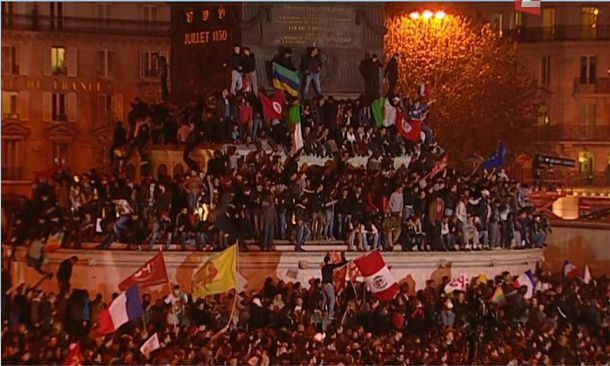 “The name of the game is called ‘Find the French Flag.’” That’s priceless ... and sad. Given the anti-Americanism out of France over the past 60+ years, this American is enjoying the (further) devolution of France. I’m sitting in my Schadenfreude chair and can’t suppress the occasional giggle. As the great American philosopher Nelson Mundt says, “HA-hah!” Sic transit gloria mundi. Thanks for the on the ground report. It’s appreciated~ A co-worker came in the office today at 4am, we worked over night. He asked if I had seen the news about France and Greece. We talked about it & shook our heads. Here in NY I too have to show my drivers license and sign in to vote, naturally we’re registered to a party first. The French flag it’s that same colors as ours here. I see by your photos people like to fly a flag of a different color. They do the same thing here in the states. I work with a polish guy who immigrated here in the 1970’s. He has mentioned many times, he never thought he’d see the United States turn the way it has. I told him, well their is no more money left in fighting a cold war. Frogman, I figured the rise of Socialisme would get a new post from you, then you are going to have to submerge again, since we already know that Parti Socialiste has declared you an enemy of the State. Time to step out on the Vichys, Brother. Death with honor is still just death. Glad to you see you back on the Web! I find it fascinating that Europeans do not seem to grasp that the funds for their glorious society must come from somewhere. Where do they think money comes from, anyways? I especially like the 75 percent tax rate coming for the “rich” French citizens. How many people with that kind of money are just going to wait around and let the French Government take it? When all of the rich leave, where are these “geniuses” going to get more money to fund their debacle? Have the idiots at the toop (or at the bottom) thought this through? I suspect that the lower income folks who stand to receive this largesse don’t really care where it comes from, but they should. For when the spring runs dry, they all will die of thirst! Keep posting Frogman! It’s always a treat reading this blog. My Dear Frogman, the election news made me want to grab my copy of Paris In The Terror and re-read it. The world is upside down and sinking fast. The USA is no better. I pray our election goes well and we can unseat the man-child in the White House. These are troubling times. Stay close. Alas, Flamby’s win confirms the suspicion that in politics all things are possible. Many of us stateside are affeared that an incumbent who engineered economic disaster, promoted (and signed into law) junk landmark legislation, blames everyone and everything but himself for his own handiwork, is self-absorbed to the point he forgets his wife in tow, is politically cynical and calculating, has no discernible moral core, has no higher goal than re-election, is incapable and misinformed—when not outright ignorant—about the powers and limits of his office, is divisive and petty—many of us are affeared that such a man might possibly get himself re-elected. How could such an astonishing thing be possible? [Pause for dreary effect.] Because Mr. Obama is running on “vision”. “Vision”, as you know, is what you hear before you vote and what you see after the election. How could Flamby be elected over the political corpses of the Parti Socialiste and his ex-domestic partner? All things apparently are possible.